Small World Suitcase * Small World Suitcase Pattern by Jodie Carleton of Ric raC [RR056] - $12.99 : PursePatterns.com, Sew your own unique purse or bag! 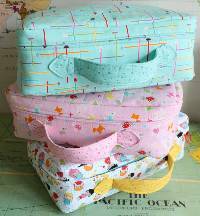 The Small World Suitcase Pattern by Jodie Carleton of Ric raC includes sewing instructions and pattern pieces for creating a super cute kids suitcase. Finished size" 10" H x 14" W.